"We ask the Lord to sustain you, and through your apostolate of prayer, to grant increased holiness in the Church and especially in the hearts of priests." 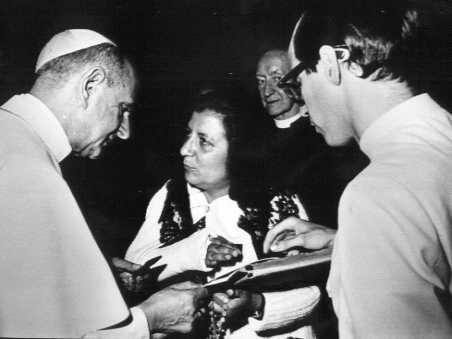 Mrs. Saraco in presenting to the Holy Father a Rosary, carefully explained that it was made from the PINE BRANCHES of the PINE TREES Our Lady Stood in at GARABANDAL. Attached to the Rosary was an object kissed by the Blessed Virgin during her numerous appearances there. 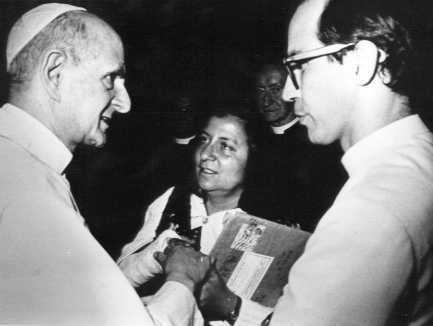 The Holy Father, after accepting the Rosary, took Mrs. Saraco's hands in His, with great affection, saying: "Thank you, thank you very much." At the May audience, the Pope explicitly approved the custom of prayers for priests. The Vatican has made no explicit ruling on the reported apparitions as yet, and will not until the prophesized events take place.